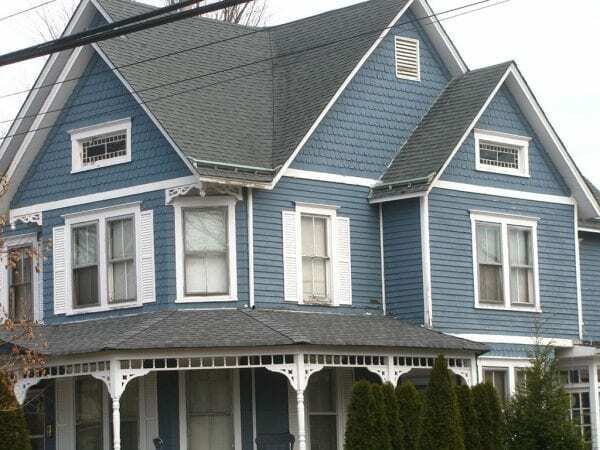 The use of fancy cut decorative shingles exploded with Queen Anne Victorian architecture. Although used in many locations, one of the most popular areas of use for these shingles was in the gable. 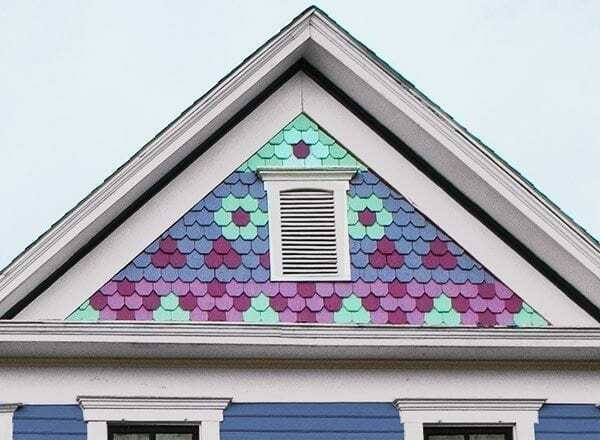 The house to the right looks really great with these fancy cut decorative shingles in a colorful pattern but as nice as it looks, this is not the right way to do it. 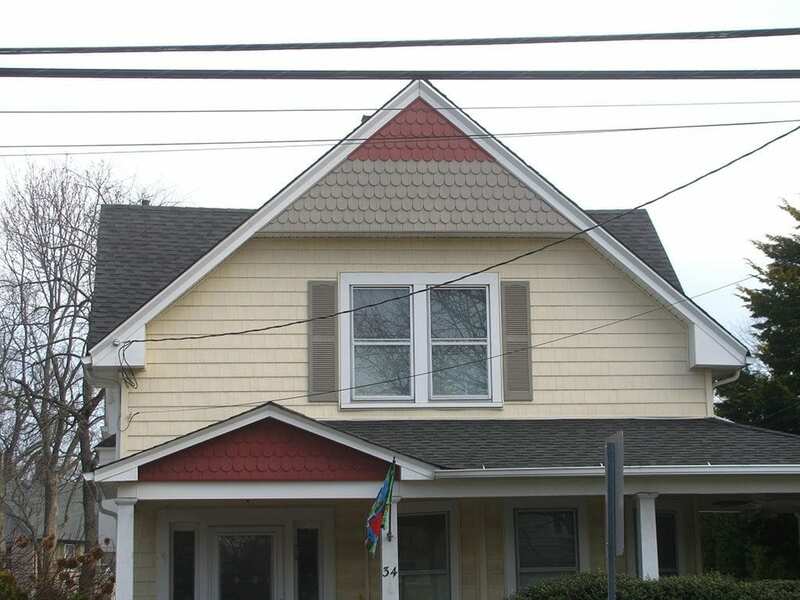 Decorative shingles painted to create a pattern in a gable. The problem is that today these decorative shingles are being overly used on all types of houses including ranch houses and installed in many incorrect ways. Here you will learn how to do it right to give your home the best curb appeal, for the wrong way can result in an awful look. 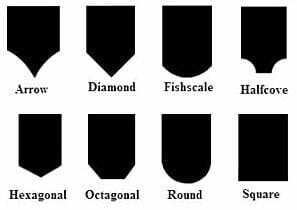 On the right you see the many fancy cut decorative shingle styles to choose from. At times you will see only one style on a house but many times different shingles styles will alternate in rows. 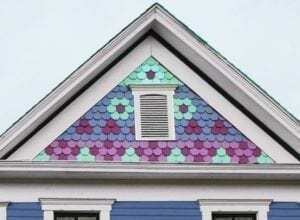 Patterns will also be designed out of different decorative shingles. In this article we will focus on the use and placement of decorative shingles in the gable of a house. This is where they are most common and this is where there are the most problems. Fancy-cut shingle options from Vintage Woodworks. Decorative shingles done the correct way. A good example to follow. Shingles are at the same surface level as the clapboard below although today builders will add shingles on top of the clapboard. This is wrong as it results in the shingles looking raised from the facade. 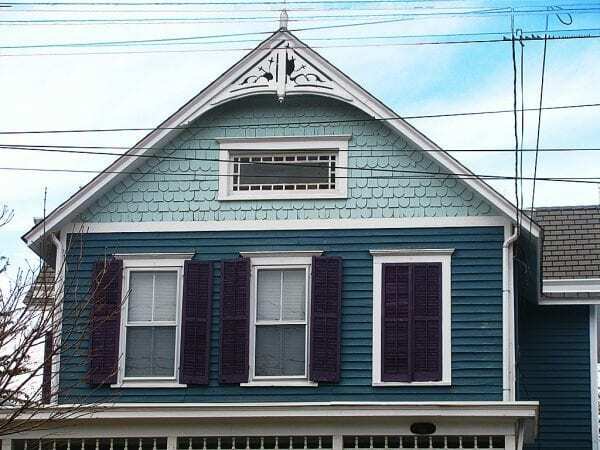 There is a horizontal piece of trim separating the decorative shingles from the clapboard. 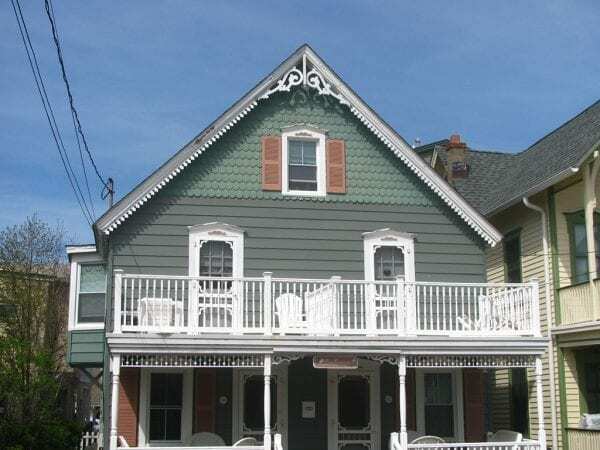 This trim distinguishes the two different surfaces and allows use of a different paint color since the shingle is a different texture than the body. This horizontal trim is located in an architecturally logical and structural location. It connects to the eaves where the attic floor begins which is at the base of the gable. It is not below the gable or above it but is at a point where there is a natural beginning and end. Decorative shingles must all be painted the same color unless there are different shaped shingles. In other words two rows of square shingles and two rows of fish-scale shingles alternating can be different colors. 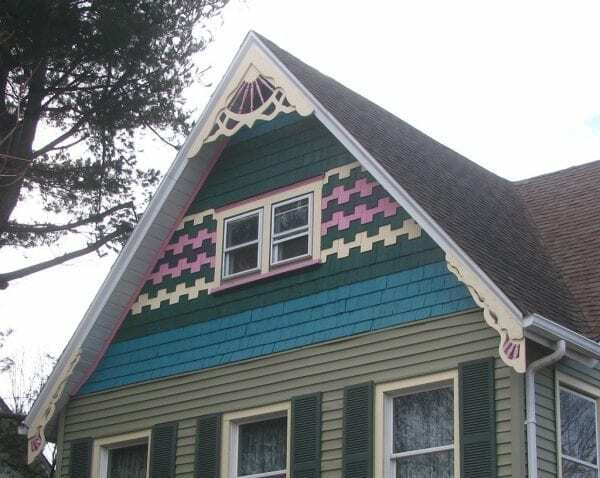 In the colorful example at the beginning it is wrong to paint a design in one type of shingle. Fish-scale shingles, square, and diamond shingles. 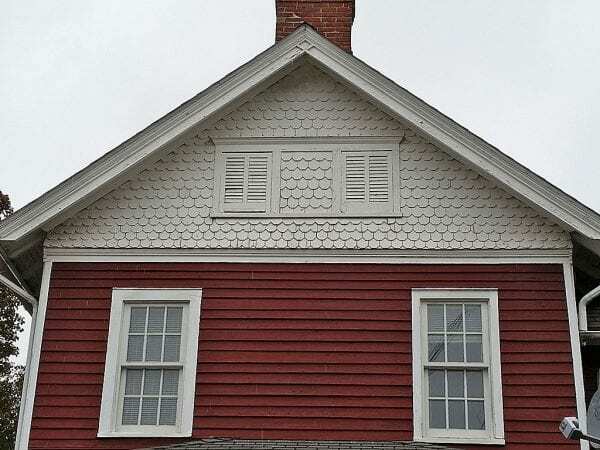 In the image above the fish-scale shingles alternate with rows of other decorative shingles and are painted differently. While the alternating paint colors like this are not really correct, the shingles as a whole differ from the clapboard and are separated by a horizontal trim as they should be. 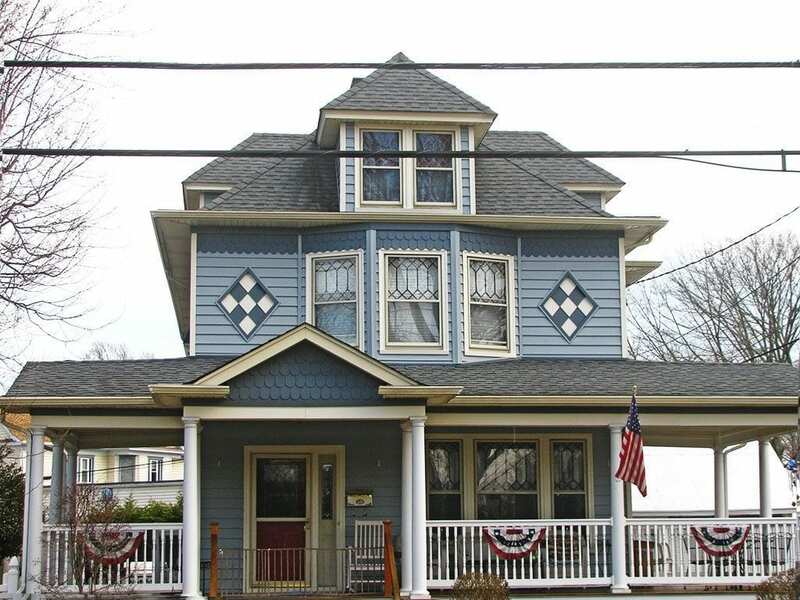 This is a historic house and the decorative shingling is done correctly. To understand what is done one must study and understand what is happening with the architecture. Notice that the horizontal trim is not in the logical location where the eaves of the gable meet the sides of the house. There is not a perfect triangle as in the preceeding image. The horizontal trim is much lower terminating at the top of the windows which is the next logical architectural point. This section of decorative shingles does not just end abruptly but wraps around the sides to complete a separate enclosed section. This is important for without this side area the shingled area would appear random and illogical. The problem is that homeowners like decorative shingles and add them to their home in the worst ways. Fine craftsmanship on horizontal trim. In this example the decorative shingles are raised away from the house but good carpentry on the horizontal trim transitions the different sidings effectively. Also notice that the decorative shingles end at a point lower than where the rake of the gable meets the corner of the house. This is because there is a frieze board that wraps around the house which makes everything appear even. The arrow points to the frieze board that connects to the decorative shingled gable resulting in a balanced look. Decorative shingles extend lower than the corner of the gable but the frieze board connects and fills in the gap on the sides of the house. Fish-scale decorative shingles added on as an after-thought. Ignore the other problems with this house but as you can see this house is vinyl sided . When vinyl decorative shingles are installed they are installed in such a way that they appear to be on top of the siding. Here the decorative shingles come away from the house and makes it look like it was added on as an after-thought. 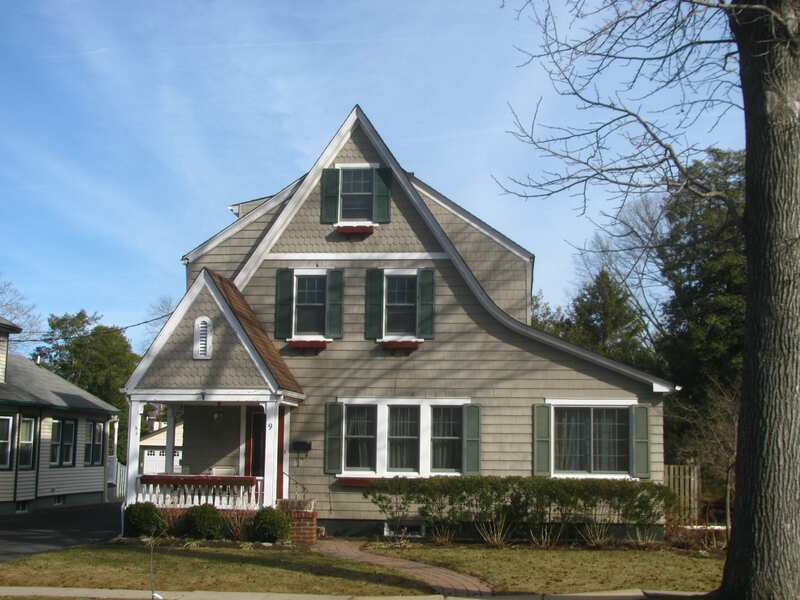 There is no horizontal trim transitioning the decorative shingles to the clapboard. Therefore to improve this house the decorative shingles and siding should be the same color. 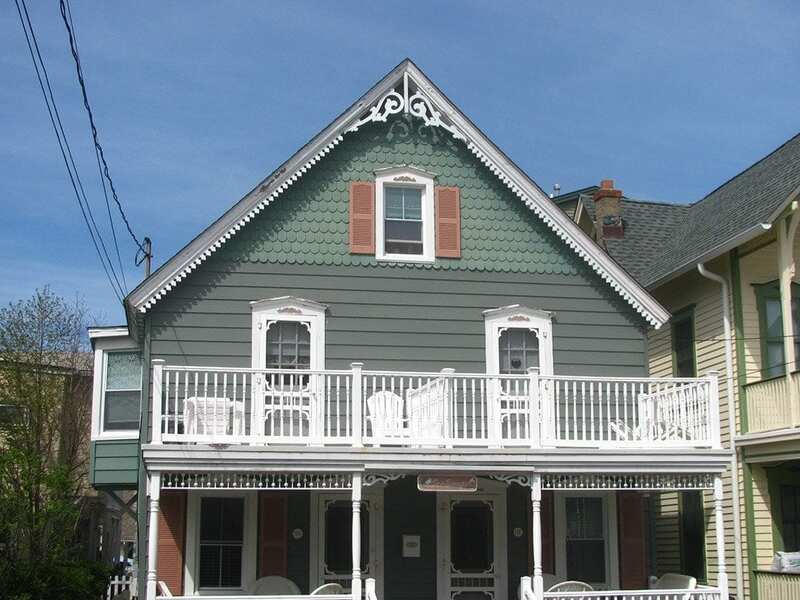 It is obvious that this historic house did not, nor was never meant to have decorative shingles. First notice that they are installed away from the house on top of the siding. Second there is no horizontal trim. 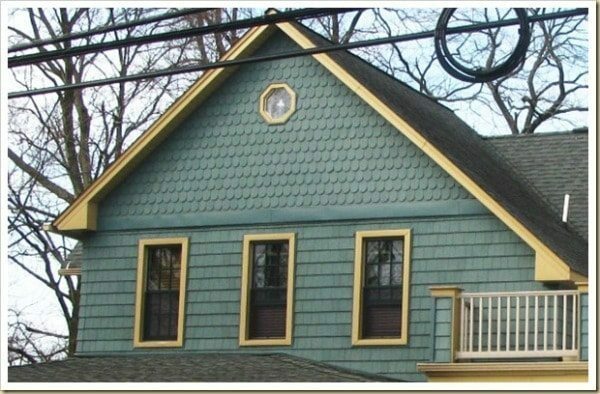 That trim however does not matter because the decorative shingles end right in the middle and there is no architecture there to have a logical end point. If the decorative shingles did extend down lower to the ends of the gable they would be interrupted by the doors, therefore this house did not and should not have decorative shingles. This is a clownish look. Why do homeowners want to turn their Ranch houses into Victorians? This is surely a clown house. Never ever put decorative shingles under the eaves of the house. Notice how it collides with the windows and ugly shutters. At least they are not a contrasting color. This is a Sears catalog home built circa 1932 but looks like a Victorian wanna-be. This gabled roof is designed to gracefully come down and sweep to the side to cover a sun-room. What you see now is a horizontal trim separating two different types of siding which makes your eyes stop there. This prevents the viewer from experiencing the facade as one unit as it was designed. I said earlier this horizontal trim is good but it has to be in the right place architecturally. There are a lot of things that need to be considered. Why couldn’t they move the horizontal trim down just a bit lower? That would almost do the trick. See with vinyl elements you are not able to accomplish what you can with wood. Notice how thick the horizontal trim is. You are taking vinyl elements and repurposing them in hope to make them look like something good. Notice how choppy it looks. This is a good one but why is it all the same color? I thought I would confuse you and throw in a good one. 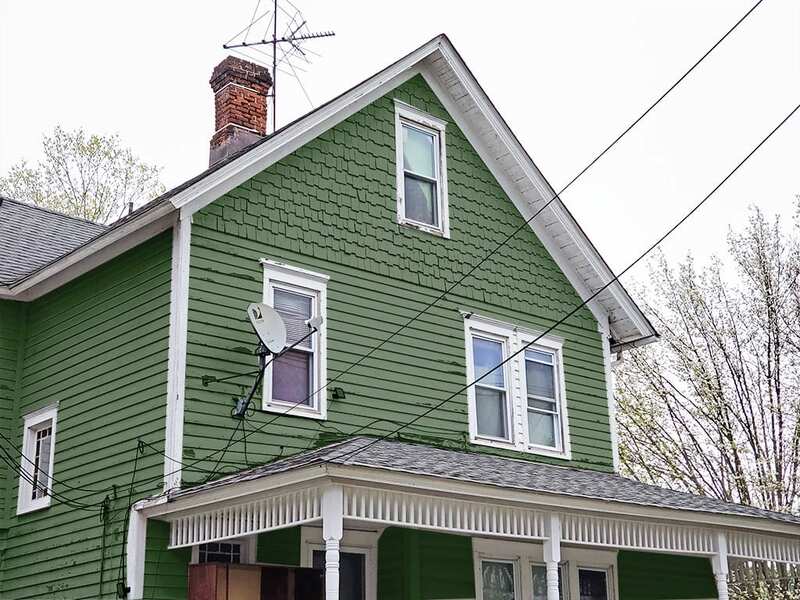 Notice how the gable siding transitions to the body siding so smoothly while the horizontal trim connects with the house so nicely. You may be thinking that boy, this house would look better if the decorative shingles were in a different color. Well if you look on the left side, 2nd floor, you will see there are also decorative shingles there. That is the reason for only one body color. You can change colors when you change siding providing there is a separation or horizontal trim. 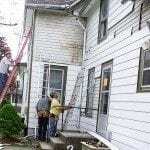 On this house the siding changes many times in many places so you need to have one color. What an ugly color combination. I would say this house originally had a horizontal trim in the correct place but it is covered up with vinyl siding. They left the decorative shingles uncovered but hid that all-important trim. Therefore, as it is now, the decorative shingles should not be picked out in a different color let alone with ugly colors like these. If you really need to put decorative shingles on your house keep them one color unless they are different shapes of shingles. Do not do this to your house. This house is a Foursquare from around 1918. 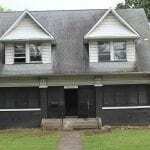 This is not a Victorian house however the homeowner tried to make it one. 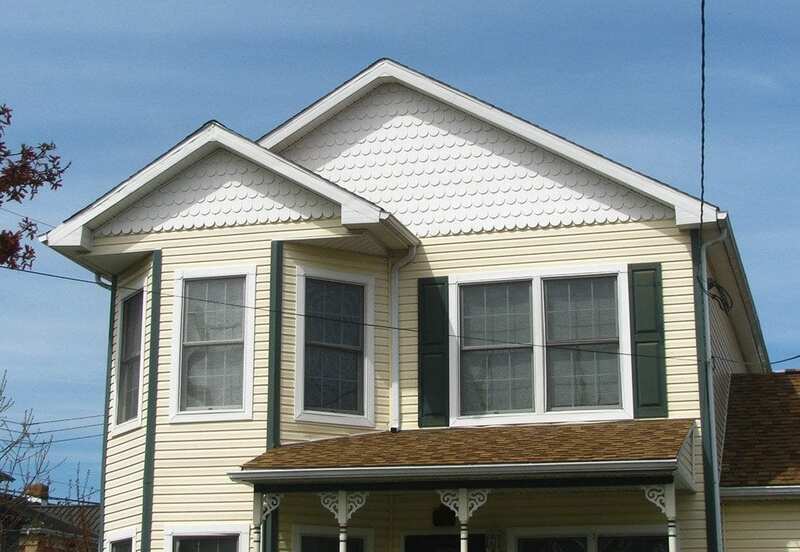 Do NOT add a valance under the eaves with decorative shingles. It’s just stupid! What’s wrong with this house? The decorative shingles in the gable are actually done correctly for they are contained in the gable. What is wrong is that if the gables were totally removed this house would look much better. Both of the gables are randomly stuck on to the roof without any regard for the architecture. Notice that they do not line up with the facade of the house. By now you should know what is wrong with this house. 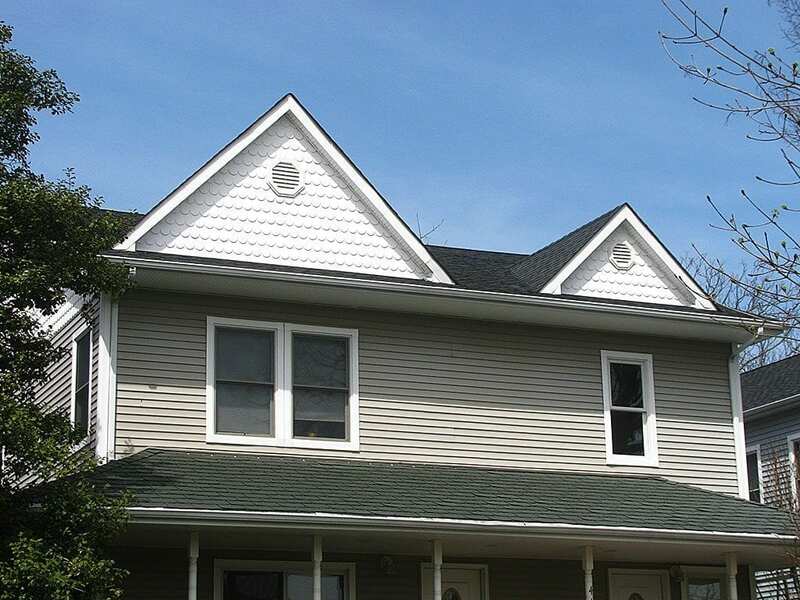 Notice that the horizontal trim does not connect properly to the gable on the right side. This house is owned by an architect who totally remuddled it. You can read the full story here . This is Correct. There is NO horizontal trim. The shingles are supposed to blend in with the clapboard. 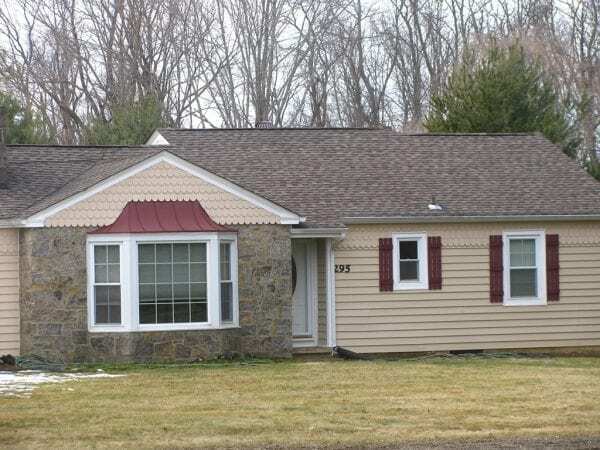 As you can see this is one subject where homeowners and contractors really fail in their attempt at curb appeal. All of the problem houses are vinyl sided which shows the application method makes a big difference. If you have a newer home and plan to do this hopefully these mistakes will help you avoid them yourselves. We at Old House Guy offer a virtual house painting service so you can make sure your house and your decorative shingles are painted correctly . I think that accenting shingles and especially purely functional banding boards with high contrast, inharmonious colors makes a house look like an odd collection of clashing bits and pieces, not a unified structure. It’s essential to coordinate colors with permanent elements and make strategic decisions about what to accent. People often just go crazy when there’s a decorative detail and don’t think things through. 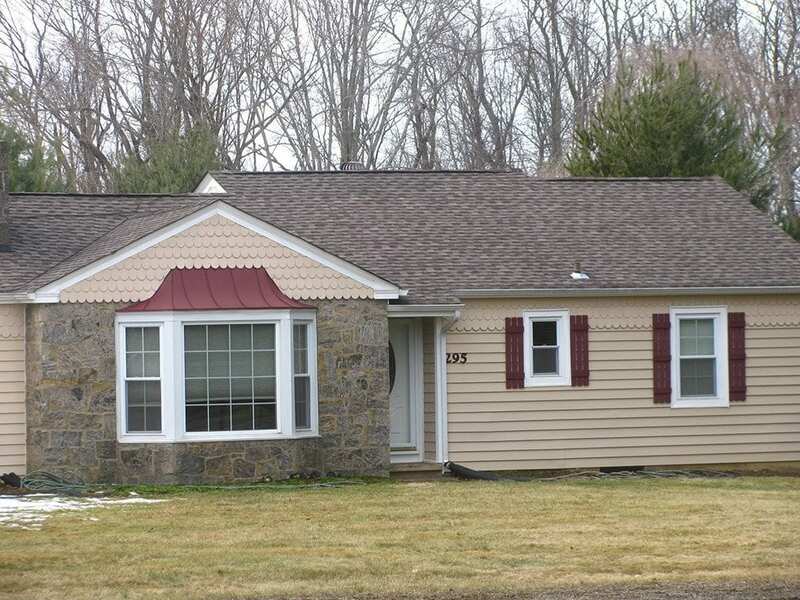 Plenty of examples of bad siding, incorrect shutters and added-on ornament in these photos too. 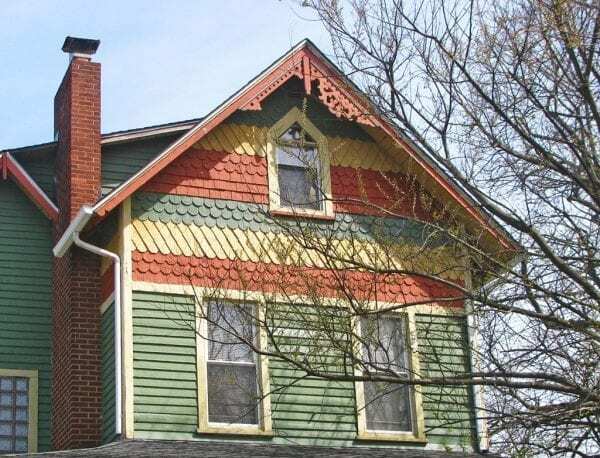 People think that Victorian equals fancy and you can just stick stuff anywhere, plus modern siding is so bare that they are encouraged by their contractors to add misplaced PVC details that look “just like” the original, but lower maintenance. Of course it usually doesn’t look just like the original and your website is the best I’ve found that points out these subtleties. It is hard and takes a lot of research and work and persistence to make it look right, especially with a limited budget on a remuddled house that has lost its original detail. I wish the building supply and building trades would make it easier for those of us who want to do the right thing. Wish I had your wisdom and experience about now! Building a Craftsman-style bungalow with the desire to make it appear 100 years old and well-maintained. 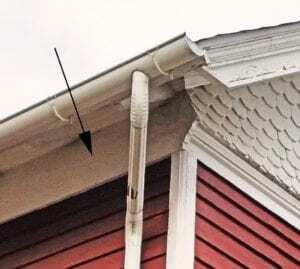 Trying to understand how all these parts go together and, while this article is extremely helpful, still don’t know if a dentil detail, at the base of the gable separating round shingles from bevel siding is flat with those items, raised above them, or??? Also adding a second building which is two story (not exactly a bungalow!) but has an architectural detail wrapping the entire building to leave the upper story detailed exactly like the bungalow. 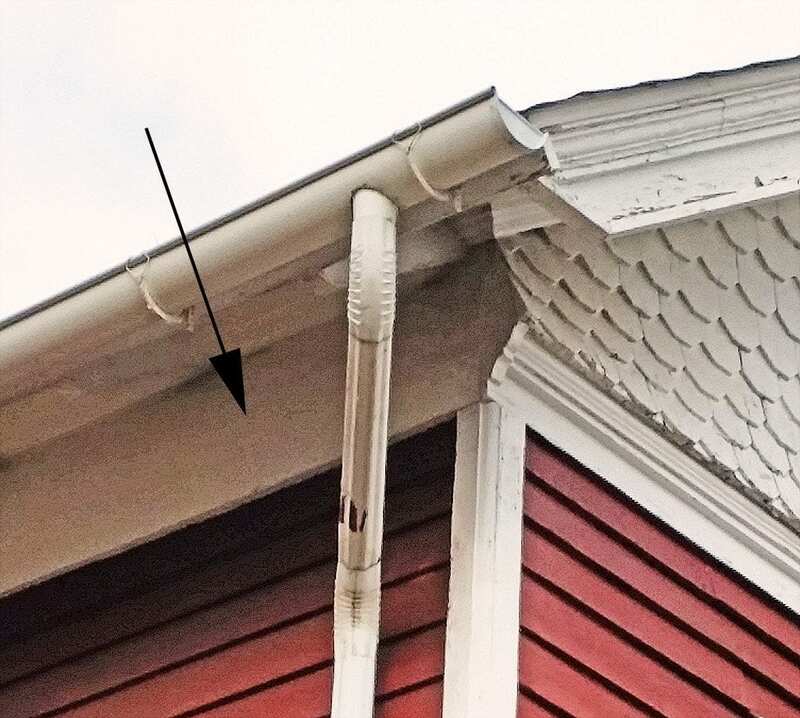 Does that detail, exactly like I wonder about the dentil, lie flush with the siding above and below, is it raised a bit, or??? Trying for as authentic as possible but, truth is, don’t know what I’m doing! 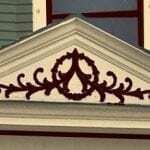 Hi – the trim attaches to the same wall as the round shingles but appears to be lower. If adding dentals they should rest slightly lower than the shingles. If they are raised they will look stuck on as an afterthought. So we need to repaint our 1980s Victorian here in Maine this summer (peeling paint plus the homeowner we just bought it front didn’t want to hire a company but also didn’t like ladders = only painted the first floor clapboard and it is a different shade than the 2nd & 3rd which were painted 10 years earlier). Our house is all red and has been known as “the big red house” for at least the last 4 decades, so we are going to stick with it. If I understand from the blue house example- our house has standard clapboard on the 1st & 2nd floors, but diamond, square, and round on the 3rd floor on all sides (also, square going up the round turret/tower in the front)- then our siding should be all one color (which it is currently)? Correct? Also, how do you feel about using milk paint as an authentic product? 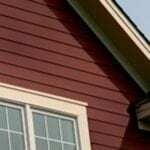 ( https://www.realmilkpaint.com – says that with an outdoor additive and tung oil, it works wonderfully well on wood siding) – thoughts? Sounds like you have it right. I have had no experience with milk paint. Don’t take this wrong, but you remind me of the Mark Levin of architecture! I’m a lot intimidated. I must say I really do enjoy your commentary and envy your knowledge.You put into words what I’ve thought of new house building for decades. I’m 62 and have been a stay at home mom and grandma. Not any education beyond high school, but have a love of old beautiful architecture. I think maybe my Catholic upbringing helped foster this love. My husband and I are planning on building a folk victorian on 6 acres we own. I’ve been a stay at a home mom and now grandma with no formal education beyond high school so feel inept to design a home and am afraid of what builder battles I may face. There’s a house built in early 1900 here that I want to replicate. Not so much inside; but the outside is so sweet! I know my husband will insist on vinyl siding because he’s painted our house current craftsman house several times and he’s 67. Says he’ll never paint a house again! What’s a wife to do??? Any suggestions or a lost cause? Please be gentle. If you’re building a new house why not try Haridboard. They come in nice earth tone colors. Even vinyl siding has to be painted eventually. Thank you. I appreciate your efforts and I think I generally understand what you are trying to express. Unfortunately I am confused with some of the transitions of words to pictures which make it difficult to fully understand what you are attempting to demonstrate. For example, you make a statement of “what is wrong” or what is right”, however you do not effectively clarify or highlight within the pictures (circle, outline, point to, etc.) what you mean but instead elude to what you mean and assume everyone knows what you are trying to convey. If a picture is worth a thousand words and you are trying to explain only a few of those thousand words then it will be difficult to “cherry pick” those words from a picture unless you highlight those areas within the picture; especially for the would be renovator. In short, you are doing to text and pictures what you complain that people are doing with houses! Where are the arrows that point out what you mean? Where are bad and good examples of each problem area? Where are the examples or links of “How to do it Right? Hi RJR – sorry it was confusing. Best to just follow the top example that says “How to do it right” exactly as you see it.